This lesson was taught to a bright and vibrant child with some slight challenges in hearing and speech. 5 years old. Fine motor skills undeveloped. Cannot draw or write (YET). He had class after his brother and I made sure that we did not put the blocks away before the new lesson. Therefore his first task was put away blocks. He sorts and counts blocks as he puts them away. Counting to nine several times as a warm up...then we built 10, 9 , 8, 7, at the lowest degree of difficulty where I put the blocks in first and he just has to put the block that matches in the tray, for example the nine is in the tray and he has to put a one in there to make 10...etc. See picture below. Then he built them himself with no help. But still at the lowest degree of difficulty where he put in one thu 9 or 1 thru 9 etc ad ten added the matching addend. Building them one at a time is the next degree of difficulty. 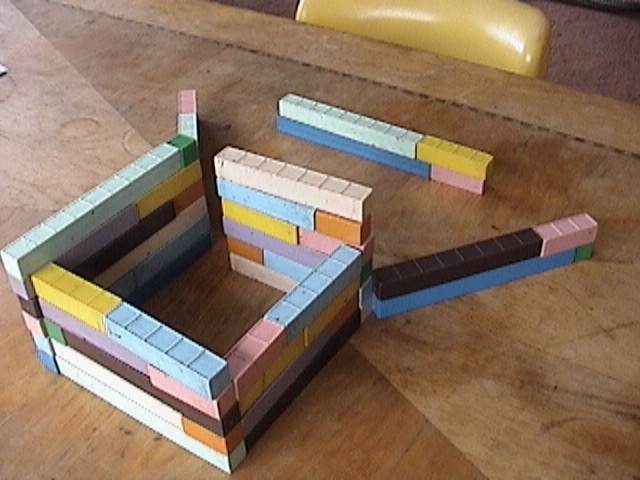 I then made him use alternating hands to put the blocks in the tray, he could not pick up a block with the same hand twice in a row, thus engaging more of his brain and making it more FUN. He showed me each hand before he grabbed the block he wanted and I nodded and smiled each time giving him positive reinforcement. Then we counted on our fingers. Two fingers on this hand three on the other: how many? He had a little trouble putting up his fingers and copying me, but it was fun ad we did lots of combinations less than 5, obviously. 2 + 2, 3 + 2, 4+5, 4+4 etc. He always counted starting at one, even if he knew one hand was 5 and the other 3. He started 1, 2, 3, 4, 5 and then 6, 7, 8. They have to be taught to start at FIVE and then count 6, 7, 8. this takes patience and practice because they always want to start at one just to be sure. We are counting on our fingers now because one day soon we will NOT be counting on our fingers. Fingers are a crutch we will ween off of shortly. Like training wheels on your bike, we won't need them once we get going and it will actually hamper you once you want to go fast and do tricks. We will know these facts "by heart" and the child will know all 45 addends by heart too. He had fun making up his own problems for me to count, part of the fun was getting his fingers to do what he wanted them to do. We then counted to 20 by fives using all our hands...we did this several times. Many students come to me with an F in algebra and can't add 7 + 8 without either counting on their fingers (as seripticiously as possible) or stopping to think about it. Multiplying 7 x 8 also gives them pause. Fractions poorly understood...gee how come they don't get algebra? But I digress. Then just for fun we built 3's and 4's because it's super easy, fun and quit because an hour had gone by. Note we never once used paper and pencil or even a white board. Been busy. Have done hours of tutoring since my last post. Here is a description of what happened for one of of those hours. Student 7 years old. Normal to above average intelligence. Slight hyperactivity. Expressed in hyperkenetic activity and extreme talkativeness. He's a regular kid. First we built tens on down to two's. Then we talked about subtraction, and with the blocks right there verbally drilled him on facts. 10 take away 4, 8 kids in the room, three leave how many left? Etc. Did 15 different facts and five that were the same. Did not relate subtraction and addition. In other words 10 - 4 = 6 Is exactly the same problem as 6 need what to be ten...when you have the blocks. He had the tray to look at the whole time. So it was easy. Soon he will only have symbols...but first he will be absolutely confortable with blocks and drawing. Then we talked about division and multiplication. Here we see symbols only and we have adjusted the symbols to fit the blocks the way we wanted. You don't see that we changed the sevens to show five across 7 down and used 5's because 5 is contained in 35, seven times. We also talked about how to read that expression...4 IS CONTAINED IN 16 four times. He could see that, it was visually obvious. We then added the arrows for the pattern across and down. and as you can see he got the blocks out to help him. All he had to do was count the down he already knew the one side and how many in the rectangle, I thought he would get out 5's but he got out 4's because he knew the answer. That problem says build 20 with fives. He was in a situation where he could not fail. So he was confident. The important part was he got it right and understood that he had to count the other side. He also understood 4 is contained in 20 five times. Multiplication and division all at once. They are inverse functions after all. We talked briefly about the factors (ie the factors of x2+ 7x + 10 are (x + 2)(x + 5) ) but mostly we were concerned with the 10 being made up of 2 fives or 5 twos. then did x2+ 10x + 21 then x2+ 10x +16 which you see pictured here. He has 2 on top and 8 on the side. (x + 8) across and (x + 2) up. x2+ 10x + 16 = (x + 8) (x + 2). We were more focused on the 2 x 8 part. The algebra is a bonus as it were. (!) It was much faster to make it with two 8's than with eight 2's. This is known as the economy of counting. We discussed this concept only briefly. But it's obvious it's faster to count 8, 16, than 2, 4, 6, 8, 10, 12, 14, 16...we did both of course. Then x2+ 10x + 24 and lastly x2+ 10x + 9. Note how much math is going on here and why I call it compound teaching. He is learning all the addends for 10, the factors of the algebraic expressions and some the factors of the numbers 25, 21, 16, 24 and 9. We are working on all of this all at once and having fun doing it. Nothing scary or hard about it. Then the hour was up. 60 minutes flew by. Today we did some simple sorting and counting with a bag of change. The wee ones learned the names of the coins using a three period lesson, although they will need more reinforcement, for the next few hours they have the names of the coins down. Again, it's not about storage, it's about retrieval and building the pathways to the information that is contained in the mind. It has taken us a long time to figure out the mind is not contained in the head, although the brain is. The brain is simply our interface with the mind. 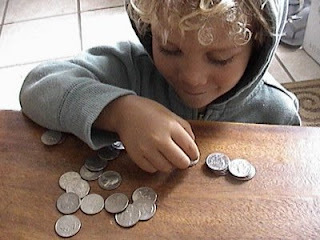 In the picture we have sorted out the quarters and are stacking them, later he will be able to ask questions like why do we stack them in fours but dines in fives and pennies in fives and even nickles in fives? They watched PBS kids and sorted coins...the youngest one said "this is taking too long" and later "we will be counting coins forever" but he watched TV and sorted coins, sorted coins and watched TV and soon they were in their respective piles...we celebrated with some yays and clapping. First we did a quick math lesson on same. I just brought a tiny white board into bed. Often we watch Multiplication Rock vids...but today we did this instead. They love erasing same on both sides. ||| : = || ::. The could easily see same because I had color pens, the x's are blue lines, the units green dots. One little boy got to erase two on one side the other little boy got to erase two on the other. We talked about HERO ZERO! (2x - 2x) older students hear hero zero no fun get back to one repeatedly. 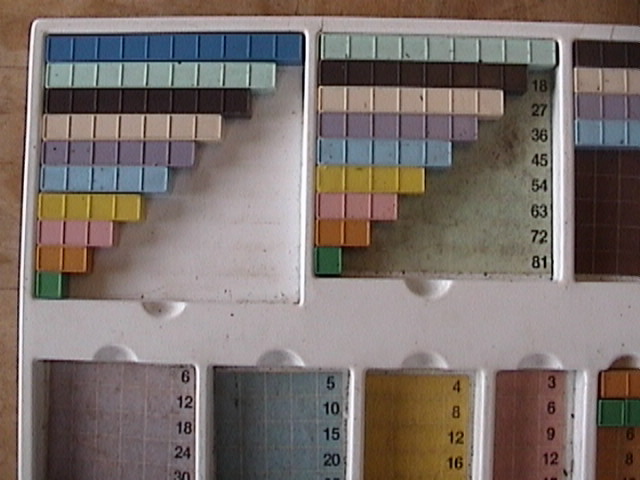 Then we erased two green ones from each side. One boy got to erase two green ones from one side and the other got to erase two from the other. This took a lot of counting and thinking for the 4 year old using his fingers to take away 2 from three 2 from 2 and 2 from 5 BUT ALL WE DID WAS COUNT and understand the CONCEPT of same. So if x =3 then each blue bar is a THREE. :. :. :. .. = :. :. :. .. Counting to 11 was a big deal...and lots of fun. I expect this blog will chronicle my adventures in building the Crewton Ranone Math Wild Thing. It will also chronicle class by class some of my students so you can see what happens in an hour. Or during "math time" (which can be anytime) in the case of the toddlers. It's not magic and it's not that I'm such a great teacher; it's that I have great tools and that I have a great methodology.